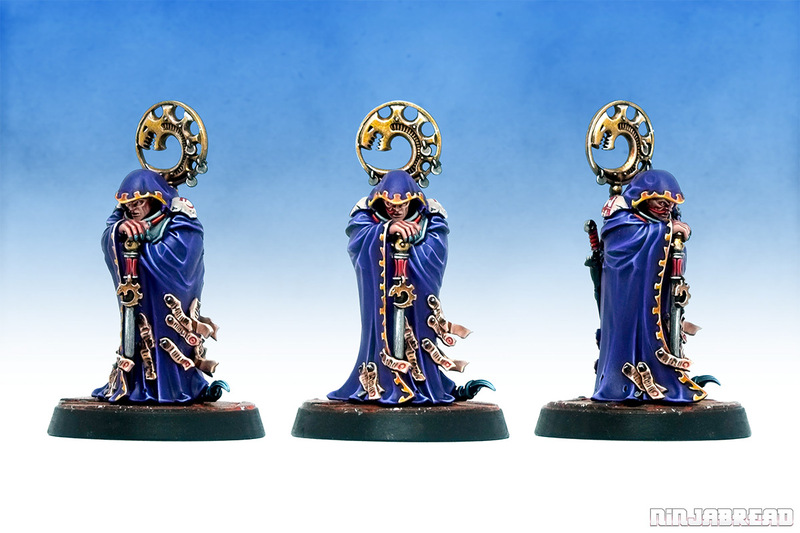 The sentinel-like pose, with him resting nonchalantly on his weapon in a set of long hooded robes, is one of Citadel Miniatures' time-honoured sculpting tropes. Chaos Dwarf Khazek Doomlord, Human Wizard Pedregar the Green and one Champion of Tzeentch have also appeared with it. 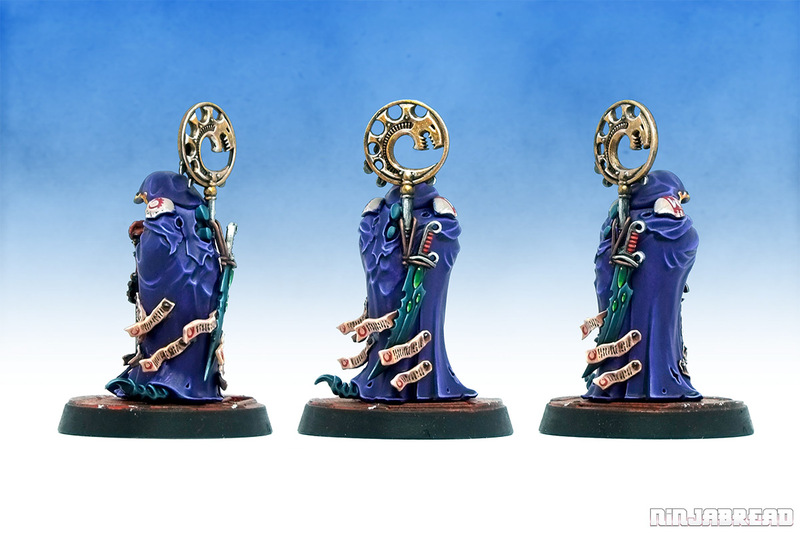 There's a cheeky little Genestealer tail poking out under the robes' hem which tells you he's more than human, and when you get round the back there's a set of carapace ridges that make you wonder about what generation of Hybrid he is. The shoulderpads I painted with a little Cult icon and a W so when you look at the miniature from above it spells out "CW" – my initials. Here he is on an advance casting of the Scrap Fort from Fogou Models, which is my ongoing major terrain project at the moment. I'll be showing off the complete fort soon, and maybe using it as a rationale for growing the Genestealer Cult (can't have just one Locus knocking about in such a large fort on his own). As the Locus is 95% robes, he's a great miniature for teaching the technique for painting cloth. 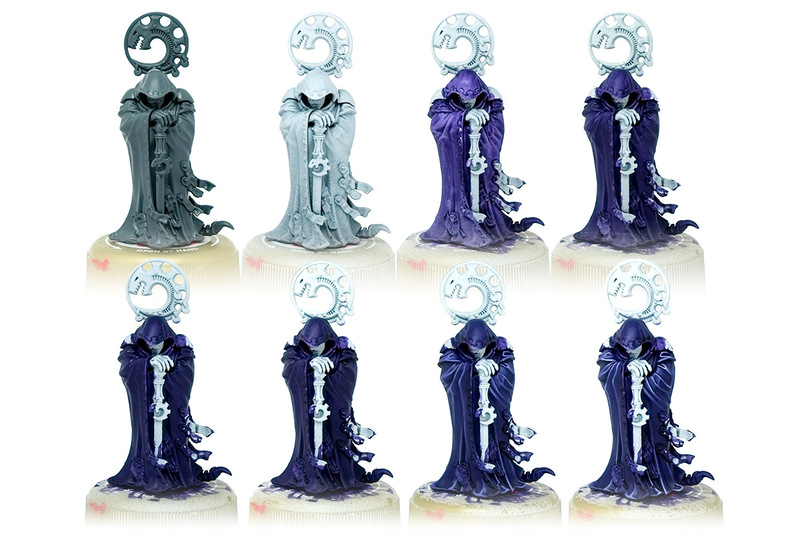 The purple uses a "wet-blending" method that's been photographed between stages from all angles and written up clearly and comprehensively, breaking down the theory, technique and colours used. It's my seventh instalment in the Patreon tutorial series that's proved really popular. Big thanks to last month's new patrons Craig, John, Steve, Ben, Jason, David, Toby, Jamie, Victor, Dimitrios, André, Alan, Brian, Alexander and Philipe. 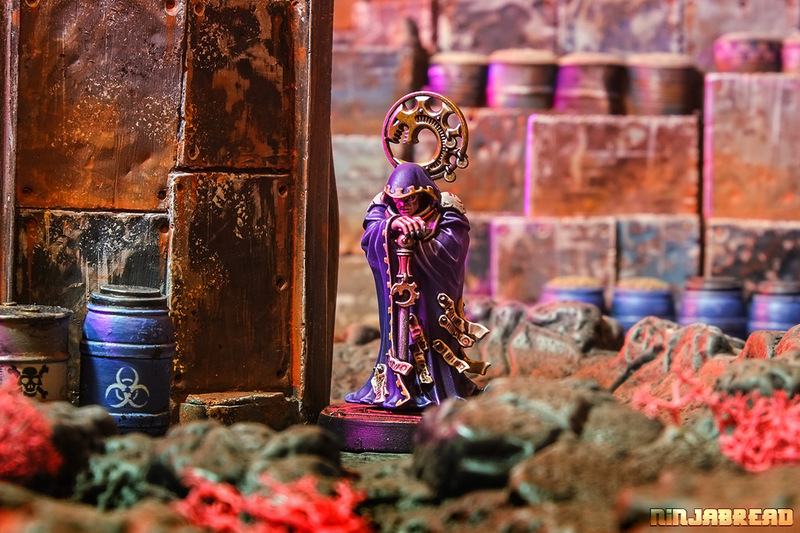 The Genestealer Cult range is dripping with great models, from homages to the original Rogue Trader range (the Nexos), and new character types (like the Locus and the Kelermorph) which mean my Cult will inevitably grow. Though I might take an oldskool detour with the vintage 1980s Throned Patriarch and some Bob Olley Hybrids. Watch this space! I like the paint job. The cult is a very tempting range to collect. That's amazing work on the cloth of the robes! Yeah Syrinx, the range slowly and insidiously works its way into your subconsicous and convinces you you need it. Like the Cult in real life.